When my large black cat, Max Factor, started hanging around my door I chased him away. He was rather pathetic looking with his fur having bald spots. Talk about having Cat Health Problems! I had intended to call Animal Control and hope that they could find him a home. He had such pleading big green eyes I thought someone would adopt him. Little did I know that my husband had started feeding him..........big mistake. Investigating cat skin issues would soon command my attention. We didn't want to bring a strange animal into the house that might have some disease such as ringworm that could be transferred to our 2 current cats so he was fed outside for a few days and then taken to the vet to be checked out. FeLV screening, worms, fleas and blood work-up to help check liver and kidney functions. He passed with flying colors except for the cat health problems with his skin. My vet determined that he had been well cared for most of his life which was guessed to be 2 years old. The assumption was that he had been abandoned. There are apartments nearby and when people move to a new area sometimes it doesn't allow pets. So there he was fat and sassy and then thrust into the reality of living outdoors....and the realm of cat health problems. The vet diagnosed him with severe stress which caused him to groom himself continually, causing the fur to fall out. I had to choke back a laugh...a cat stressed...I found this amazing but it did make sense. During this visit we learned about cat skin problems and his particular problem, Cat Hair Loss aka Alopecia or "compulsive over-grooming. Cat Health Problems ..or cats fleas? 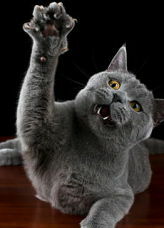 All cats scratch periodically but persistent itchiness can be pruritus. It almost always means cat health problems indicating a disease. Such pathological pruritus may stem from a local skin irritation such as a parasite infestation or an allergy. In allergic itch, a foreign substance (antigen) incites a defensive response from the skin's mast cells. These cells secrete a chemical called histamine, which stimulates itch sensitive nerve endings. Allergic skin reactions can be local i.e. an itchy spot caused by a contact irritant or they can be systemic leading to all-over itchiness. Fleas on cats are the usual culprits. 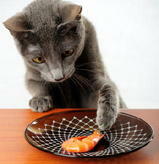 Cats are often hypersensitive to flea saliva, so even a small dose can set off a systemic allergic reaction. One flea bite a week is enough to cause your cat to be itching a lot. 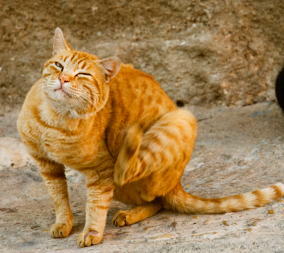 Another itchy skin possibility is mange mites (tiny, spider like parasites) which live in or on feline skin or fur. The most notorious is the cat ear mites (odectes cynotis) which leaves coffee-ground-like stuff in the ears of the cat. There is also head mange (feline scabies) demodetic mange and Cheyletiella mange (walking dandruff). This last one is a real problem because it can spread from cats to people. A cat with this one has lots of visible skin flakes but won't necessarily be uncomfortable. If these leave the cat and land on the owner, the human host will be very itchy. Another problem is cat ringworm. Let's not forget ticks. Ticks appear at different times of the year across the country so check with your vet to find out when your "tick season" is. Check outdoor cats daily during the tick season and remove any ticks immediately. Ticks are most often found in and around the ears, under the legs, or on the neck. Grasp the tick with tweezers (not your fingers, as ticks can carry many potentially dangerous diseases) and gently pull it out of the skin. It's head will be buried in the skin. If you "anesthetize" it first with alcohol, it's easier to pull out. Drop the tick into rubbing alcohol until it is dead. In our case, Max was denuding himself for reasons other than fleas or mites. His constant licking right down to the skin is a behavior called -psychogenic alopecia- and it's a form of displacement activity. Cats are, in effect, distracting themselves from anxiety. If you suspect your cat has skin problems your vet will have to run some tests but you can speed the diagnosis (and expense) by giving your vet some detailed background of the problem. Flea allergies usually cause itching on the back, especially towards the tail; food or inhalant allergies usually affect the head and neck; and psychogenic alopecia usually involves the legs and abdomen. So many skin problems on cats are tied to flea and mite infestations that the first treatment step is to eliminate any parasites from the cat and it's living quarters. If your cat has a chronic skin problem that cannot be remedied, your vet can help control the ailment using antihistamines to stop itching, anti-obsessional drugs to discourage excessive licking or glucocorticoids to fight inflammation. 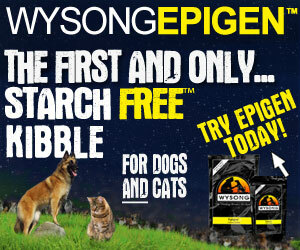 read more at Cat Skin Health. Cat frequently have problems with their eyes also. Whether it be a scratch on the eye from another cat or an allergy it can be an issue. 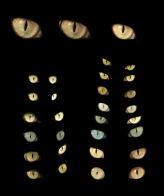 Details are on Cat Eye Problems and Feline Sore Eyes pages. 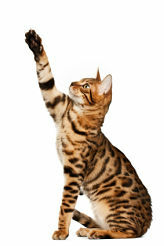 If your vet prescribes oral pills for any cat health problems there is also a link to the page Pilling a Cat.